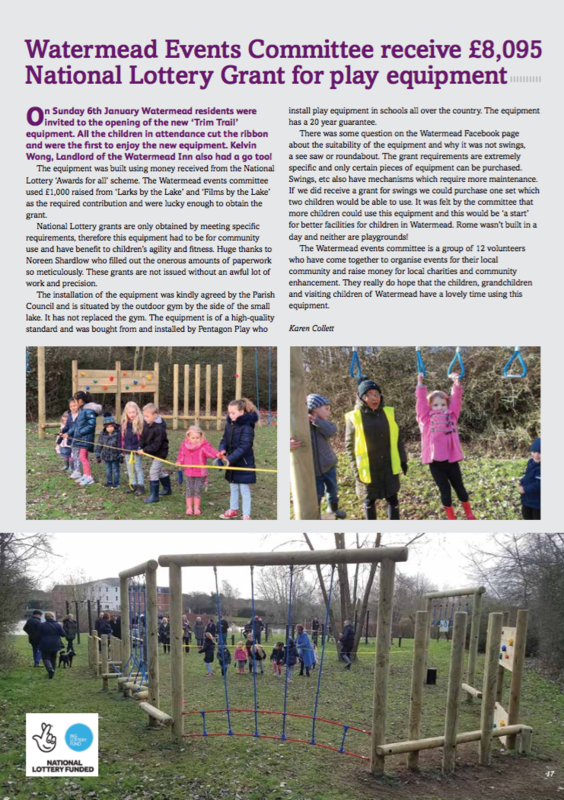 In our Winter 2013 issue of the Village View we reported that a resident of Watermead, Peter Stocker was designing and creating a commemorative plinth. The structure being made of the original walkway would be dedicated to the new walkway. After the high water levels we are thrilled to report that the plinth has now been installed alongside the walkway. The Parish Council along with the residents of Watermead thank you Peter for this wonderful creation. It’s a great place to visit, especially when the sun is shining, to enjoy a relaxed drink outside on the bandstand. You will also find our ever-hungry ducks who aren’t too shy to come up to you in search of food. It is preferable to feed duck food which is available from pet stores. They do eat bread but by the end of a sunny afternoon they are so full they tend not to fight for food! Visitors to Watermead are welcomed. However, we would ask that you put your litter in the bins provided, or take it home if they are full. We also have many dog waste removal bins - please use them. We hope you enjoy your visit. Please note that camping and the lighting of fires are strictly prohibited in Watermead. You may visit between dawn and dusk any day. Dogs must be kept strictly under control at all times. Please keep your dog on a lead if it is unruly or boisterous.